Canning is an important, safe method of food preservation if practiced properly. The canning process involves placing foods in jars and heating them to a temperature that destroys microorganisms that could be a health hazard or cause the food to spoil. Canning also inactivates enzymes that could cause the food to spoil. Air is driven from the jar during heating, and as it cools, a vacuum seal is formed. The vacuum seal prevents air from getting back into the product bringing with it microorganisms to recontaminate the food. Home Canning is an important, safe method of food preservation if practiced properly. Clostridium botulinum bacteria are the main reason why pressure canning is necessary. Though the bacterial cells are killed at boiling temperatures, they can form spores that can survive these temperatures. The spores grow well in low-acid foods, in the absence of air, such as in canned vegetables and meats. When the spores begin to grow, they produce the deadly botulinum toxin (poison). These spores can be destroyed by canning the food at a temperature of 240 °F, or above, for the correct length of time. This temperature is above the boiling point of water so it can only be reached in a pressure canner. There are two safe ways of canning, depending on the type of food being canned. These are the boiling water bath method and the pressure canner method. Boiling Water Bath Method: The boiling water bath method is safe for fruits, tomatoes and pickles as well as jams, jellies and other preserves. In this method, jars of food are heated by being completely covered with boiling water (212 °F at sea level). High-acid foods (pH of 4.6 or less) contain enough acid that the Clostridium botulinum spores can’t grow and produce their deadly toxin. 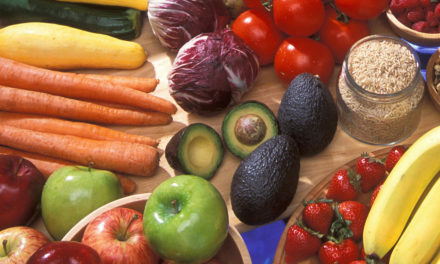 High-acid foods include fruits and properly pickled vegetables. These foods can be safely canned at boiling temperatures in a boiling water bath. Tomatoes and figs have pH values close to 4.6. To can these in a boiling water bath, acid in the form of lemon juice or citric acid must be added. Pressure Canning Methods: Pressure canning is the only safe method of canning low-acid foods (those with a pH of more than 4.6). These include all vegetables, meats, poultry and seafood. Because of the danger of botulism, these foods must be canned in a pressure canner. Jars of food are placed in 2 to 3 inches of water in a pressure canner and then heated to a temperature of at least 240 °F. This temperature can only be reached in a pressure canner. Assemble and wash equipment and containers before gathering fruits and vegetables. Gather products early when they are at their peak of quality. Do not use overripe products. Gather or purchase only as much as you can handle within 2 or 3 hours. Wash the product carefully, handling small amounts at a time. Lift the food out of the water, drain the water and continue rinsing until the water is clear and free of dirt. Dirt contains some of the bacteria that are hardest to kill. Don’t let the food soak; it will lose flavor and nutrients. The cleaner the raw foods, the more effective the canning process. Do not can decayed or damaged food items. Preparing the Jars & Lids: Examine jars and discard those with nicks, cracks and rough edges. These defects will not permit an airtight seal on the jar, and food spoilage will result. All canning jars should be washed in soapy water, rinsed well and then kept hot. This could be done in the dishwasher or by placing the jars in the water that is heating in your canner. The jars need to be kept hot to prevent breakage when they’re filled with a hot product and placed in the canner for processing. Jars that will be filled with food and processed for less than 10 minutes in a boiling water bath canner need to be sterilized by boiling them for 10 minutes. NOTE: If you are at an altitude of 1,000 feet or more, boil an additional minute for each 1,000 feet of additional altitude. Jars processed in a boiling water bath canner for 10 minutes or more or in a pressure canner will be sterilized during processing. Be sure to use new two-piece lids. Follow the manufacturer’s instructions for treating them. Some need to be brought almost to a boil and then left in hot water, while others need to be boiled for a period of time. Fruits and vegetables may be packed raw or they may be preheated and then packed into canning jars. The hot pack yields better color and flavor, especially when foods are processed in a boiling water bath. For both raw pack and hot pack, there should be enough syrup, water or juice to fill in around the solid food in the jar and to cover the food. If not covered by liquid, food at the top tends to darken and develop unnatural flavors. It takes from ½ to 1½ cups of liquid for a quart jar. Raw Pack: For this method put raw, unheated food directly in jars. Pour boiling hot water, juice or syrup over the food to obtain proper headspace. Fruits and most vegetables packed raw should be packed tightly because they will shrink during processing; however, corn, lima beans, potatoes and peas should be packed loosely because they expand during canning. Hot Pack: For this method, heat the food to boiling (or cook it for specified time) and then pack the hot food and boiling hot liquid in jars. Shrinkage has already taken place, so pack foods loosely enough to allow food to be surrounded by liquid. Use the boiling water bath method only to preserve high-acid foods such as fruits, tomatoes and pickles. Fill the canner about halfway with hot water. Turn on the burner and heat the water. For raw-packed jars, have the water in the canner hot, but not boiling, to prevent breakage of the jars when they’re placed in the canner. For hot-packed jars, use hot or gently boiling water. Fill a single jar at a time, as described above in “Methods of Pack”, allow proper headspace, remove air bubbles, and adjust lids as described below, then place the filled jar in the canner. Allow the proper headspace, according to processing directions for specific foods, in order to remove all the extra air during processing, and to form a tight vacuum seal. Run a bubble freer or any plastic or rubber-like utensil around the edges of the jar, gently shifting the food, so that any trapped air is released. Add more liquid as needed to to the jar to ensure proper headspace. Wipe off the rims of the jars with a clean, damp cloth. Screw on the lids, but not too tightly—air needs to escape during processing. Put filled glass jars on the rack in the canner. Add more boiling water or take out some as needed so that the water is at least 1 inch over the tops of the jars. If you add more water, pour it between the jars, not directly on them, to prevent breakage. Put the lid on the canner and set the heat to its highest setting. When the water in the canner reaches a rolling boil, begin counting the correct processing time. Adjust the heat to maintain a gentle and steady boil, and add more boiling water as necessary. If the water stops boiling at any time during the process, turn the heat on its highest setting, bring the water back to a vigorous boil, and begin the timing of the process over, from the beginning (using the total original processing time). Use a jar lifter to carefully remove the jars. Place the hot jars right side up on a cake cooling rack or dry towels to prevent the jars from breaking on contact with a cold surface. Avoid placing the jars in a cold draft. Do not cover with or wrap jars in towels. Leave at least 1 inch of space between jars. Allow the jars to cool untouched for 12 to 24 hours. Do not tighten the ring bands on the lids and do not push down on the center of the flat metal lids until the jars are completely cooled. Remember that pressure canning is the only safe method of processing low–acid foods such as vegetables, meat, poultry and fish. Be sure to read your manufacturer’s instructions on the use of your pressure canner. 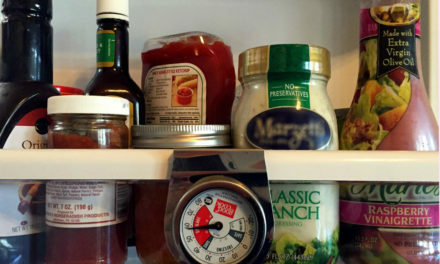 Dial-gauge canners must be tested for accuracy every year before the canning season. Call your local Extension service office to make arrangements to have your dial-gauge canner tested. Place 2 to 3 inches of water in the canner. It should be hot, but not boiling, when canning raw-packed food; hot or gently boiling for hot-packed foods. Make sure you still have 2 to 3 inches of water when you are ready to load the canner. Fill the jars as described above in “Methods of Pack”. Allow proper headspace, remove air bubbles, wipe jar rims and put on lids. See detailed instructions above in “Steps for Boiling Water Bath Methods”. Set the jars of food on the rack in the canner so steam can flow around each jar. Fasten the canner lid so that no steam begins to escape except through the vent. Turn heat to high and watch until steam begins to escape from the vent. Let the steam escape steadily for 10 minutes. This step is necessary for all pressure canners to remove air that could otherwise lower the temperature and result in underprocessing. Close the vent using a weight, valve or screw, depending on the type of canner. If you have a weighted-gauge canner that has a weight of varying pressures, be sure you are using the correct pressure. For a dial-gauge canner, let the pressure rise quickly to 8 pounds of pressure. Adjust the burner temperature down slightly and let the pressure continue to rise to the correct pressure. (If the burner were left on high, the pressure would be hard to regulate when the correct pressure is reached.) Start counting the processing time as soon as the pressure is reached. For weighted-gauge canners, let the canner heat quickly at first and then adjust the heat down slightly until the weight begins to rock gently or “jiggle” two to three times per minute, depending on the type of canner you have. Start counting the processing time as soon as the weight does either of these. Adjust the heat under the canner to maintain a steady pressure at, or slightly above, the correct gauge pressure. If the pressure goes too high, turn down the heat under the canner. Do not lower the pressure by opening the vent or lifting the weight. Loss of pressure at any time can result in underprocessing or unsafe food. If at any time the pressure goes below the recommended amount, bring the canner back to pressure and begin the timing of the process over, from the beginning (using the total original processing time). When the processing is completed, carefully remove the canner from the heat. If the canner is too heavy, simply turn it off. Let the pressure in the canner drop to zero. This will take 30 to 45 minutes in a standard heavy-walled canner and nearly an hour for a larger 22-quart canner. Newer thin-walled canners depressurize more quickly. Do not rush the cooling by setting the canner in water or by running cold water over the canner. Never lift the weight or open the vent to hasten the reduction in pressure. Forced cooling may result in food spoilage. Older canners are depressurized when the gauge on a dial-gauge canner registers zero or when a gentle nudge to the weight on a weighted gauge canner does not produce steam or resistance. New canners are equipped with a safety lock. These canners are depressurized when the safety lock drops to normal position. When the canner is depressurized, open the vent or remove the weight. Wait ten minutes and then open the canner. Sometimes safety locks that are located in the handle of a canner will stick. If a nudge to a canner weight shows that it is depressurized, remove the weight, wait 10 minutes and then run a knife blade between the handles to release the lock. Unfasten the lid, and tilt the far side up, so the steam escapes away from you. Do not leave the jars in the closed canner to cool, or the food inside could begin to spoil. Use a jar lifter to carefully remove the jars from the canner. Place the hot jars on a cake cooling rack or dry towels, right side up to prevent the jars from breaking on contact with a cold surface. Leave at least 1 inch of space between the jars. Do not tighten the lids. Allow the jars to cool, untouched for 12 to 24 hours. Test the Lid for a Proper Seal: Most two-piece lids will seal with a “pop” sound while they’re cooling. When completely cool, test the lid. It should be curved downward and should not move when pressed with a finger. If a jar is not sealed, refrigerate it and use the unspoiled food within 2 to 3 days, reprocess within 24 hours, or freeze. If liquid has been lost from sealed jars do not open them to replace it, simply plan to use these first. The food may discolor, but if sealed, and the liquid is only a little lower than the food, the food is safe. Label & Store Jars: Remove screw bands from the sealed jars to prevent them from rusting on. Wash, dry and store screw bands for later use. Wash food residue from the outside of the jars and rinse. Label, showing contents, date and lot number (if you canned more than one canner full that day). Store in a clean, cool, dark, dry place. The best temperature is between 50 and 70 °F. Avoid storing canned foods in a warm place near hot pipes, a range or a furnace, or in direct sunlight. They lose quality in a few weeks or months, depending on the temperature, and may even spoil. Keep canned goods dry. Dampness may corrode metal lids and cause leakage so food will spoil. For best quality, use canned foods within one year. If you decide to reprocess food from jars that did not seal, do so within 24 hours. To do this, remove the lid and check the sealing surface on the jar for tiny nicks. Change the jar if necessary, add a new treated lid and reprocess using the same processing time. Label the jars of food that have been recanned and use these foods first. They will be softer in texture and lower in nutritional value than food processed only once. Don’t taste or use canned foods that show any sign of spoilage! Look closely at all jars before opening them. A bulging lid or leaking jar is a sign of spoilage. When you open the jar, look for other signs such as spurting liquid and off-odor or mold. Spoiled canned foods should be discarded in a place where they will not be eaten by humans or pets. If the jars or cans are still sealed, place them in a heavy garbage bag. Close and place the bag in a regular trash container or bury it in a nearby landfill. If the jars or cans are unsealed, open or leaking, they should be detoxified before disposal. The gauge of the canner was inaccurate. Up-to-date researched processing times and pressures were not used for the size of the jar, style of pack or kind of food processed. Contact with botulinum toxin can be fatal whether it is ingested or enters through the skin. Be extremely careful not to splash or come in contact with the suspect food or liquid. Wear disposable rubber or heavy plastic gloves. Wear clothes and aprons that can be bleached or thrown out if contaminated. Carefully place the jars, with their lids, on their sides in an 8-quart, or larger pot or canner. Wash your gloved hands thoroughly. Carefully, without splashing, add enough hot water to the pot to completely cover the jars with at least 1 inch of water above the containers. Boil for 30 minutes to make sure the food and containers are detoxified. Cool and discard the containers, their lids and food in the trash or dispose in a nearby landfill. Wear rubber or heavy plastic gloves to clean up contaminated work surfaces and equipment, including can openers and clothing that may have come in contact with suspect foods or liquids. Use a fresh solution of 1 part unscented, liquid, household, chlorine bleach (5 to 6% sodium hypochlorite) to 5 parts clean water. Spray or wet contaminated surfaces with the bleach solution and let stand for 30 minutes. Avoid inhaling bleach or contact with skin. Wipe treated spills with paper towels and place paper towels in a plastic bag before putting them in the trash. Apply the bleach solution to all surfaces and equipment again, and let stand for 30 minutes and rinse. Wash all detoxified counters, containers, equipment, clothing, etc. Discard gloves when cleaning process is complete. 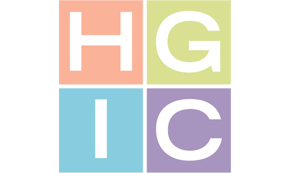 For more information on canning foods at home, see HGIC 3020, Home Canning Equipment or HGIC 3000, Preserving Foods.